D&D London is one of the largest UK-based restaurant chains, with a reach that extends to 30 restaurants around the UK and other major capital cities such as Paris, Tokyo and New York. Plateau is one branch of the D&D family tree, and the décor of the restaurant is suitably attired to serve the likes of a Canary Wharf business crowd. It’s shiny and polished, with a slick city feel to it. Located on the fourth floor of Canada Square, right above Waitrose, the restaurant grants wonderful views of Canada Square. On a long sunny summer’s day this would offer a true spectacle of the hordes of people gathered around to enjoy the warm weather. Plateau is divided between the Bar & Grill and the main restaurant. The former offers a more casual dining menu, whereas the latter bears a more contemporary French theme. In addition to the à la carte there was a three-course £25 set menu available on the night of our visit. It’s one of the things that D&D London does quite regularly – offering set price three-course menus through TopTable or The Evening Standard. In this day of austerity, these fixed-price options can be an attractive proposition for those wishing to seek out an opportunity of dining at a reasonably budget price in the swanky type setting that is a trademark of most D&D restaurants. 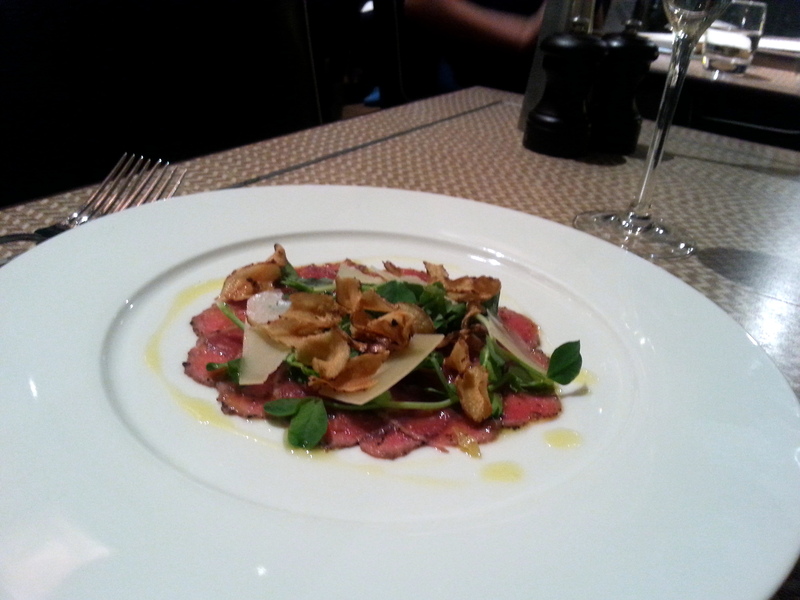 Well we tried both options – three courses from the à la carte menu, and three courses from the £25 menu. Starting with what we ate from the à la carte first: a risotto cooked with a Jerusalem artichoke stock (£9) was nicely done, although the rice could have done with slightly less time for a more al dente finish. A red wine reduction served as a finishing touch and added a nice sweetness to the risotto, but the flavour of a promised garlic and parsley butter as listed on the menu was not discernible. 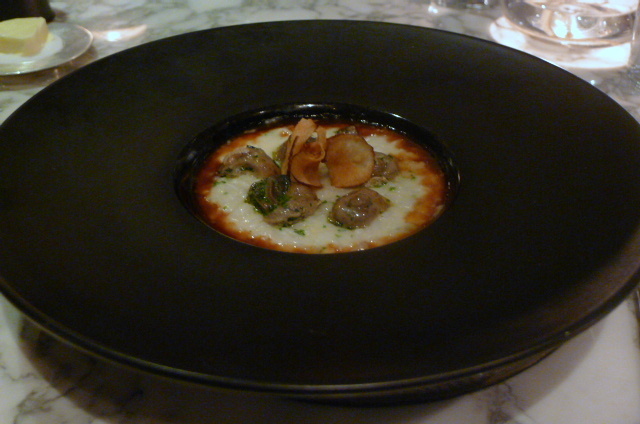 Furthermore, the braised Aylesbury snails that topped the dish were overcooked and bland.